Epus. Bangor. Ds. Hardwicke, Cancellarius. Thanks to the Bishop of Norwich, for his Sermon. Ordered, That the Thanks of this House be, and are hereby, given to the Lord Bishop of Norwich, for the Sermon by him preached before this House, on Wednesday last, in the Abbey Church, Westminster; and he is hereby desired to cause the same to be printed and published. Hodie 2a vice lecta est Billa, intituled, "An Act for explaining several Powers contained in the Will of William late Lord Craven, for making Jointures and Leases; and for rendering the same Powers more effectual, for the Purposes thereby intended." Vis. Torrington. L. Bp. Rochester. L. Bp. Bristol. L. Abergavenny. Their Lordships, or any Five of them; to meet at the usual Time and Place, on Tuesday the 29th Day of this Instant January; and to adjourn as they please. Capt. Chalmer's Petition about Parties withdrawn. 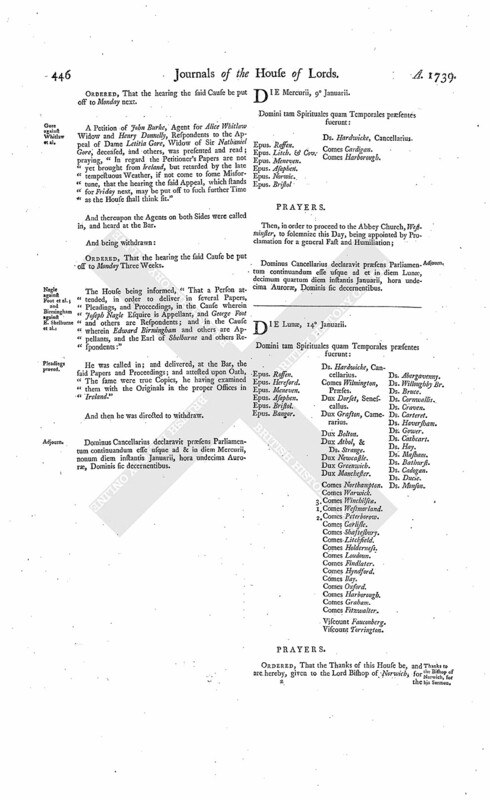 A Petition of Captain John Chalmer, was presented, and read; setting forth, "That, in the Appeal of Sir James Cunyngham Baronet, preferred to this House the 16th of November last, he has complained of Two Interlocutors of the Lords of Session in Scotland, made previous to a former Appeal to this House of the said Appellant; and that, in his present Appeal, he has made the Earls of Loudoun and Stair, and Colonel William Dalrymple, Respondents thereto, though they were not Parties to the Suit in the Court below;" and praying, "That the said Two Interlocutors, and the Names of the said Earls and Colonel, may be struck out of the said Appeal." And then they were directed to withdraw. And, Consideration having been had of this Matter, the said Petition was, by Leave of the House, withdrawn. 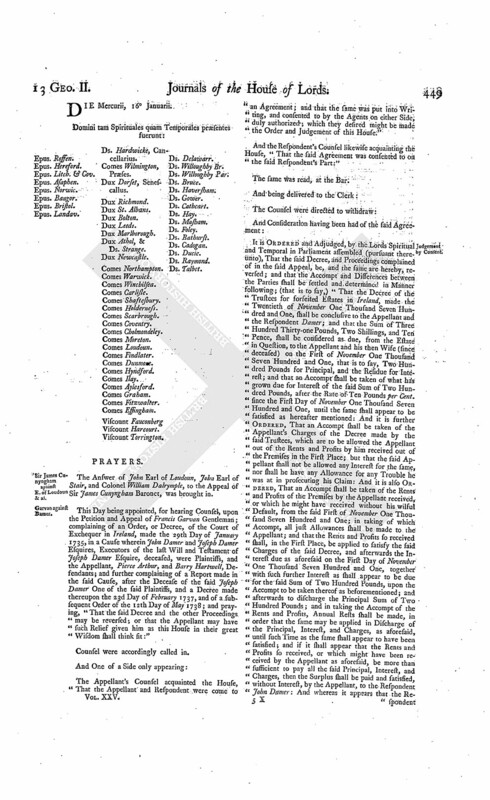 Directors of the South Sea Company's Petition, concerning the Bill for encouraging the Trade to America, &c.
Upon reading the Petition of the Court of Directors of the Governor and Company of Merchants of Great Britain, trading to The South Seas, and other Parts of America, and for encouraging the Fishery, on Behalf of the said Company, praying, "In regard the said Company have declared themselves willing, on easy and reasonable Terms, to grant Licenses to any Persons desirous of becoming Adventurers within the Limits prescribed by an Act of Parliament passed in the Ninth Year of the Reign of Queen Anne, for erecting a Corporation, for carrying on a Trade to The South Seas, and a Charter granted to the said Company by Her said late Majesty, pursuant to the said Act; that the Rights and Privileges to which they are entitled may be preserved to them, in such Manner as to this House shall seem meet; and that the said Company may be heard, by their Counsel, touching the Matter of the Bill now depending, for the more effectual securing the Trade of His Majesty's Subjects to America, before the same be passed into a Law:"
It is Ordered, That the said Petition be referred to the Committee of the whole House to whom the said Bill stands committed. Cruwys to enter into a Recognizance for Attorney General. The House being moved, "That Henry Gruwys Esquire may be permitted to enter into a Recognizance for His Majesty's Attorney General, on account of his Appeal depending in this House:"
It is Ordered, That the said Henry Cruwys may enter into a Recognizance for the Appellant, as desired. Capt. Vernon's Petition referred to Committee. 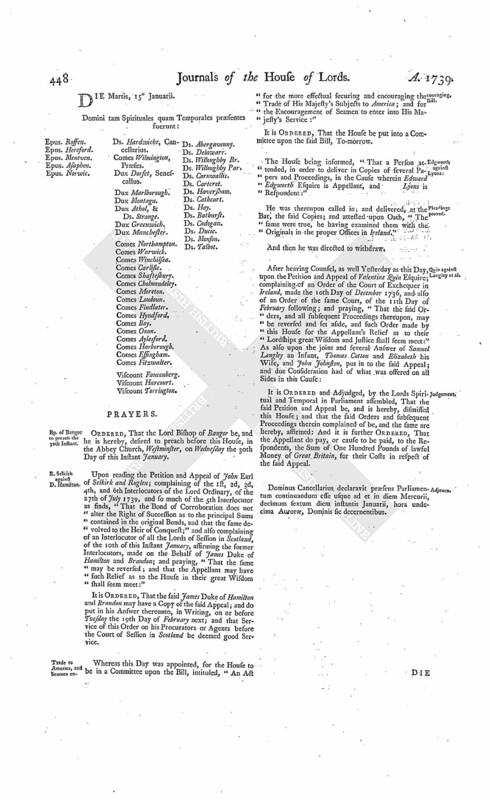 Upon reading the Petition of Captain John Vernon; setting forth, "That there is a Petition of Jane Vernon Widow now depending in this House, desiring Leave to bring an Appeal against the Petitioner, from a Decree of the Court of Chancery in Ireland, made so long ago as the Year 1686;" and praying, "In regard to the Circumstances of this Case, that the said Petition may be rejected:"
It is Ordered, That the said Petition of Captain Vernon be referred to the Committee to whom the Petition of Mrs. Vernon stands referred. Ordered, In regard the Matters in Difference are accommodating, that the Hearing of the said Cause be further put off to Wednesday next. Quin against Langley et al. It is Ordered, That the further Hearing of the said Cause be adjourned till To-morrow. Dominus Cancellarius declaravit præsens Parliamentum continuandum esse usque ad et in diem Martis, decimum quintum diem instantis Januarii, hora undecima Auroræ, Dominis sic decernentibus. Bp. of Bangor to preach the 30th Instant. Ordered, That the Lord Bishop of Bangor be, and he is hereby, desired to preach before this House, in the Abbey Church, Westminster, on Wednesday the 30th Day of this Instant January. E. Selkirk against D. Hamilton. Upon reading the Petition and Appeal of John Earl of Selkirk and Ruglen; complaining of the 1st, 2d, 3d, 4th, and 6th Interlocutors of the Lord Ordinary, of the 27th of July 1739, and so much of the 5th Interlocutor as finds, "That the Bond of Corroboration does not alter the Right of Succession as to the principal Sums contained in the original Bonds, and that the same devolved to the Heir of Conquest;" and also complaining of an Interlocutor of all the Lords of Session in Scotland, of the 10th of this Instant January, affirming the former Interlocutors, made on the Behalf of James Duke of Hamilton and Brandon; and praying, "That the same may be reversed; and that the Appellant may have such Relief as to the House in their great Wisdom shall seem meet:"
It is Ordered, That the said James Duke of Hamilton and Brandon may have a Copy of the said Appeal; and do put in his Answer thereunto, in Writing, on or before Tuesday the 19th Day of February next; and that Service of this Order on his Procurators or Agents before the Court of Session in Scotland be deemed good Service. Trade to America, and Seamen encouraging, Bill. Whereas this Day was appointed, for the House to be in a Committee upon the Bill, intituled, "An Act for the more effectual securing and encouraging the Trade of His Majesty's Subjects to America; and for the Encouragement of Seamen to enter into His Majesty's Service:"
It is Ordered, That the House be put into a Committee upon the said Bill, To-morrow. The House being informed, "That a Person attended, in order to deliver in Copies of several Papers and Proceedings, in the Cause wherein Edward Edgworth Esquire is Appellant, and Lyons is Respondent:"
He was thereupon called in; and delivered, at the Bar, the said Copies; and attested upon Oath, "The same were true, he having examined them with the Originals in the proper Offices in Ireland." And then he was directed to withdraw. It is Ordered and Adjudged, by the Lords Spiritual and Temporal in Parliament assembled, That the said Petition and Appeal be, and is hereby, dismissed this House; and that the said Orders and subsequent Proceedings therein complained of be, and the same are hereby, affirmed: And it is further Ordered, That the Appellant do pay, or cause to be paid, to the Respondents, the Sum of One Hundred Pounds of lawful Money of Great Britain, for their Costs in respect of the said Appeal. Dominus Cancellarius declaravit præsens Parliamentum continuandum esse usque ad et in diem Mercurii, decimum sextum diem instantis Januarii, hora undecima Auroræ, Dominis sic decernentibus. Epus. Landav. Ds. Hardwicke, Cancellarius. Sir James Cunyngham against E. of Loudoun & al. The Answer of John Earl of Loudoun, John Earl of Stair, and Colonel William Dalrymple, to the Appeal of Sir James Cunyngham Baronet, was brought in. This Day being appointed, for hearing Counsel, upon the Petition and Appeal of Francis Garvan Gentleman; complaining of an Order, or Decree, of the Court of Exchequer in Ireland, made the 29th Day of January 1735, in a Cause wherein John Damer and Joseph Damer Esquires, Executors of the last Will and Testament of Joseph Damer Esquire, deceased, were Plaintiffs, and the Appellant, Pierce Arthur, and Barry Hartwell, Defendants; and further complaining of a Report made in the said Cause, after the Decease of the said Joseph Damer One of the said Plaintiffs, and a Decree made thereupon the 23d Day of February 1737, and of a subsequent Order of the 12th Day of May 1738; and praying, "That the said Decree and the other Proceedings may be reversed; or that the Appellant may have such Relief given him as this House in their great Wisdom shall think fit:"
Counsel were accordingly called in. The Appellant's Counsel acquainted the House, "That the Appellant and Respondent were come to an Agreement; and that the same was put into Writing, and consented to by the Agents on either Side, duly authorized; which they desired might be made the Order and Judgement of this House." And the Respondent's Counsel likewise acquainting the House, "That the said Agreement was consented to on the said Respondent's Part:"
The same was read, at the Bar. 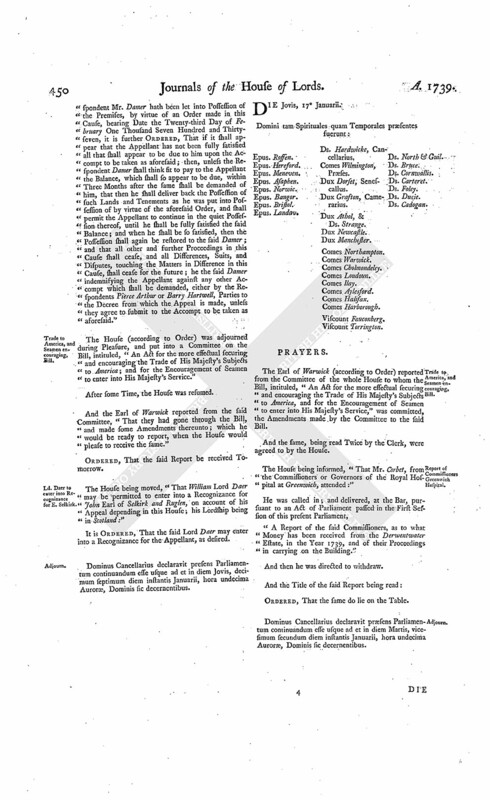 It is Ordered and Adjudged, by the Lords Spiritual and Temporal in Parliament assembled (pursuant thereunto), That the said Decree, and Proceedings complained of in the said Appeal, be, and the same are hereby, reversed; and that the Accompt and Differences between the Parties shall be settled and determined in Manner following; (that is to say,) "That the Decree of the Trustees for forfeited Estates in Ireland, made the Twentieth of November One Thousand Seven Hundred and One, shall be conclusive to the Appellant and the Respondent Damer; and that the Sum of Three Hundred Thirty-one Pounds, Two Shillings, and Ten Pence, shall be considered as due, from the Estate in Question, to the Appellant and his then Wife (since deceased) on the First of November One Thousand Seven Hundred and One, that is to say, Two Hundred Pounds for Principal, and the Residue for Interest; and that an Accompt shall be taken of what has grown due for Interest of the said Sum of Two Hundred Pounds, after the Rate of Ten Pounds per Cent. since the First Day of November One Thousand Seven Hundred and One, until the same shall appear to be satisfied as hereafter mentioned: And it is further Ordered, That an Accompt shall be taken of the Appellant's Charges of the Decree made by the said Trustees, which are to be allowed the Appellant out of the Rents and Profits by him received out of the Premises in the First Place; but that the said Appellant shall not be allowed any Interest for the same, nor shall he have any Allowance for any Trouble he was at in prosecuting his Claim: And it is also Ordered, That an Accompt shall be taken of the Rents and Profits of the Premises by the Appellant received, or which he might have received without his wilful Default, from the said First of November One Thousand Seven Hundred and One; in taking of which Accompt, all just Allowances shall be made to the Appellant; and that the Rents and Profits so received shall, in the First Place, be applied to satisfy the said Charges of the said Decree, and afterwards the Interest due as aforesaid on the First Day of November One Thousand Seven Hundred and One, together with such further Interest as shall appear to be due for the said Sum of Two Hundred Pounds, upon the Accompt to be taken thereof as beforementioned; and afterwards to discharge the Principal Sum of Two Hundred Pounds; and in taking the Accompt of the Rents and Profits, Annual Rests shall be made, in order that the same may be applied in Discharge of the Principal, Interest, and Charges, as aforesaid, until such Time as the same shall appear to have been satisfied; and if it shall appear that the Rents and Profits so received, or which might have been received by the Appellant as aforesaid, be more than sufficient to pay all the said Principal, Interest, and Charges, then the Surplus shall be paid and satisfied, without Interest, by the Appellant, to the Respondent John Damer: And whereas it appears that the Re spondent Mr. Damer hath been let into Possession of the Premises, by virtue of an Order made in this Cause, bearing Date the Twenty-third Day of February One Thousand Seven Hundred and Thirtyseven, it is further Ordered, That if it shall appear that the Appellant has not been fully satisfied all that shall appear to be due to him upon the Accompt to be taken as aforesaid; then, unless the Respondent Damer shall think fit to pay to the Appellant the Balance, which shall so appear to be due, within Three Months after the same shall be demanded of him, that then he shall deliver back the Possession of such Lands and Tenements as he was put into Possession of by virtue of the aforesaid Order, and shall permit the Appellant to continue in the quiet Possession thereof, until he shall be fully satisfied the said Balance; and when he shall be so satisfied, then the Possession shall again be restored to the said Damer; and that all other and further Proceedings in this Cause shall cease, and all Differences, Suits, and Disputes, touching the Matters in Difference in this Cause, shall cease for the future; he the said Damer indemnifying the Appellant against any other Accompt which shall be demanded, either by the Respondents Pierce Arthur or Barry Hartwell, Parties to the Decree from which the Appeal is made, unless they agree to submit to the Accompt to be taken as aforesaid." The House (according to Order) was adjourned during Pleasure, and put into a Committee on the Bill, intituled, "An Act for the more effectual securing and encouraging the Trade of His Majesty's Subjects to America; and for the Encouragement of Seamen to enter into His Majesty's Service." And the Earl of Warwick reported from the said Committee, "That they had gone through the Bill, and made some Amendments thereunto; which he would be ready to report, when the House would please to receive the same." Ordered, That the said Report be received Tomorrow. Ld. Daer to enter into Recognizance for E. Selkirk. The House being moved, "That William Lord Daer may be permitted to enter into a Recognizance for John Earl of Selkirk and Ruglen, on account of his Appeal depending in this House; his Lordship being in Scotland:"
It is Ordered, That the said Lord Daer may enter into a Recognizance for the Appellant, as desired. Dominus Cancellarius declaravit presens Parliamentum continuandum esse usque ad et in diem Jovis, decimum septimum diem instantis Januarii, hora undecima Auroræ, Dominis sic decernentibus. Viscount Torrington. Ds. North & Guil. The Earl of Warwick (according to Order) reported from the Committee of the whole House to whom the Bill, intituled, "An Act for the more effectual securing and encouraging the Trade of His Majesty's Subjects to America, and for the Encouragement of Seamen to enter into His Majesty's Service," was committed, the Amendments made by the Committee to the said Bill. And the same, being read Twice by the Clerk, were agreed to by the House. 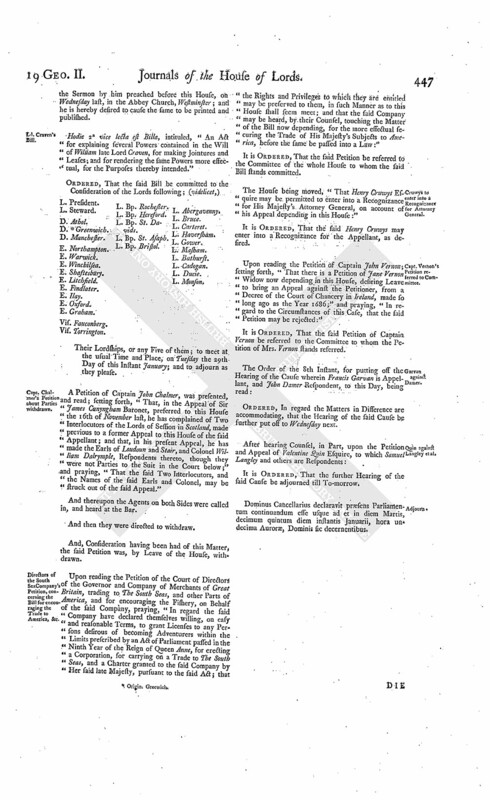 Report of Commissioners Greenwich Hospital. The House being informed, "That Mr. Corbet, from the Commissioners or Governors of the Royal Hospital at Greenwich, attended:"
"A Report of the said Commissioners, as to what Money has been received from the Derwentwater Estate, in the Year 1739, and of their Proceedings in carrying on the Building." Ordered, That the same do lie on the Table. Dominus Cancellarius declaravit præsens Parliamentum continuandum esse usque ad et in diem Martis, vicesimum secundum diem instantis Januarii, hora undecima Auroræ, Dominis sic decernentibus.